TX10 Series offers thermocouple thermometers that support K, J, E and T type thermocouples. There are three models available: 1-channel single-function, 1-channel multi-function, and 2-channel multi-function models. Press this key to hold the measured value. Up to ten data items can be stored. When recalled, the stored data value is displayed with its memory number. 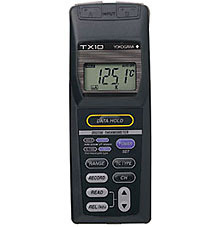 Calibration and adjustment can be mode easily by operating the panel keys on instrument and a measurement-standard. With each press, the channel switches through the sequence of "chA," "chB," and then "chA-chB." A held measured value, can be stored in the memory of an optional memory number, which is selected with the up, down keys. Stores the maximum and minimum values from the time the RECORD key is pressed. Every time this key is pressed, the maximum and minimum values, stored data, and the current measured data are displayed in sequence. Displays measured values with reference to the value obtained immediately before this key was pressed (relative value). Each press of this key can select or release the relative display. Sets the correction value, and selects active/inactive of the simplified correction function. Used to select a memory number when calling up stored data. Also used to adjust the correction value for simplified correction mode.